Violas are tuned by turning the pegs the strings are wrapped around. Tightening the string raises the pitch; loosening the string lowers the pitch. Many violas also have fine tuners mounted on each string near the tailpiece. With these the tension of the string can be adjusted more gradually by turning the small screw. Violas are tuned C-G-D-A, with C being the lowest string. 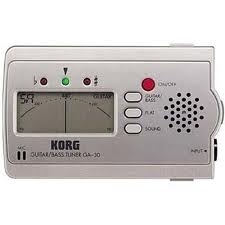 The easiest way to tune a viola is with an inexpensive digital tuner. Many not only create a note to tune to but also have a display that indicates which direction the string needs to be tuned and when it's tuned correctly. Experienced players sometimes use a tuning fork. 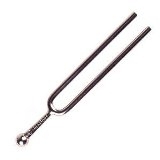 An A-440 tuning fork creates the pitch for the A string. From that reference point a Violist tunes each of the other strings, recognizing the correct intervals between them.